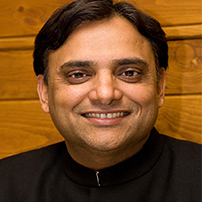 Dr.Partap Chauhan, BAMS, is the pioneer of Ayurvedic Telemedicine. He started the world’s first Ayurvedic website, jiva.com, in the year 1995, and was the first to give online consultations to people from all over the world. Partap Chauhan is the only Ayurvedic doctor to have won the prestigious “World Summit Award” given by United Nations Organization, Geneva, for his Teledoc project designed to help rural population using technology. For his social entrepreneurial skills, he has been selected a lifetime Ashoka Fellow, by the Ashoka Foundation, USA. Dr. Chauhan is the founder of Jiva Ayurveda, an Ayurvedic company that offers online, telephonic and personal consultation to patients across the world. Based in Faridabad, Delhi NCR, Jiva runs a network of 70 clinics all over India and the world’s largest Ayurvedic Telemedicine Center, giving free consultations to more than 6000 patients daily, through 300 well-trained Ayurvedic doctors. Dr. Chauhan runs a popular Ayurvedic health shows daily on various prime Television channels and more than 200 million people in India and abroad collectively view his program. Dr. Chauhan has traveled to more than 40 countries spreading the knowledge of Ayurveda to common people. He has established Jiva Ayurveda Schools in Japan, France, Poland and Lithuania. He has written several books on Ayurveda which have been translated to many foreign languages including French, Russian, Lithuanian and Polish. He has won various National and International Awards for his services towards Ayurveda.